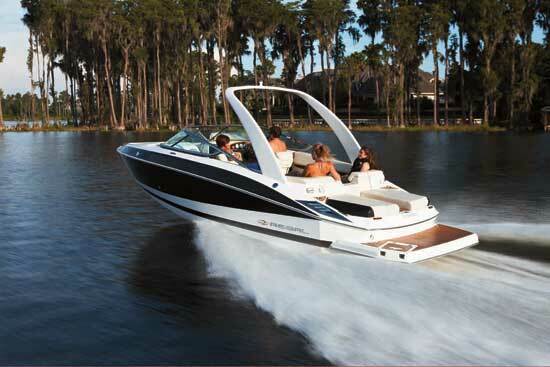 Regal 2400: Sporty style and performance to match. You've heard the old expression about March coming in like a lion? 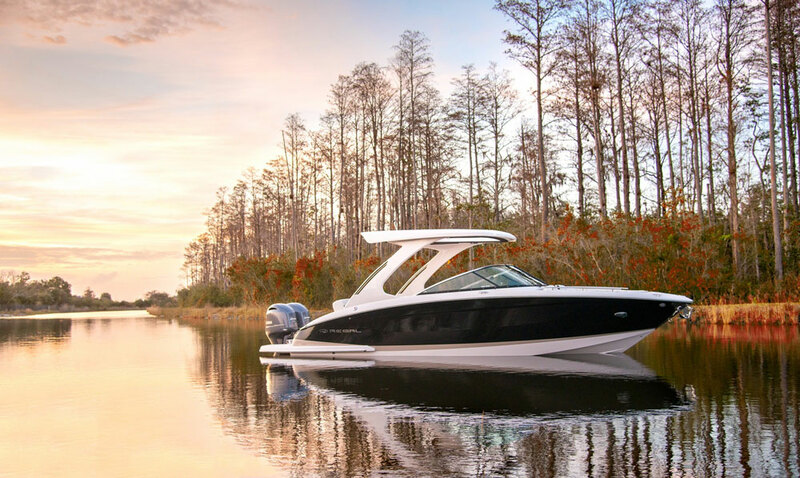 Well, on the cold winter morning when we tested the Regal 2400, near Regal Marine Industries' Orlando, Florida headquarters, the weather was more like a grizzly bear. The temperature was in the upper 30s, as the result of a Canadian cold front that somehow made it all the way to this part of the so-called "Sunshine State." 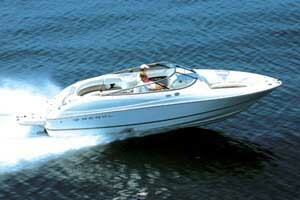 However, things began to heat up pretty quickly, once we hit the throttle of Regal's sporty new bowrider. 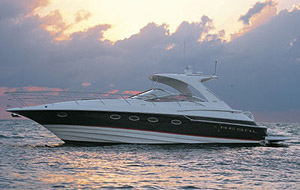 The 2400 is built on Regal's proprietary FasTrac hull. This stepped hull design improves overall running efficiency by reducing friction and drag, resulting in increased speed, control and fuel economy. The design is similar to that found on offshore race boats. Since the first Regal FasTrac was introduced in 1996, we have tested several of them — and every time, it's hard to take the boat back to the dock. This time, even winter weather couldn't chill our enthusiasm. Two things we noticed right away when running this FasTrac-equipped boat were its straight-as-an-arrow tracking and the secure feeling we got when taking turns. We found that the responsive Regal 2400 handles remarkably like a sports car: Turn the wheel, and it goes precisely where you point it. Even doing tight figure-eight turns, we experienced no loss of control and no discernable prop cavitation. Our Regal 2400 was quick off the line, getting on plane in just under 4 seconds. Midrange acceleration was strong, too. That's particularly impressive when you consider that our test boat was powered by the smallest engine option: a 270 hp Volvo Penta 5.0 GXi Duoprop stern drive. 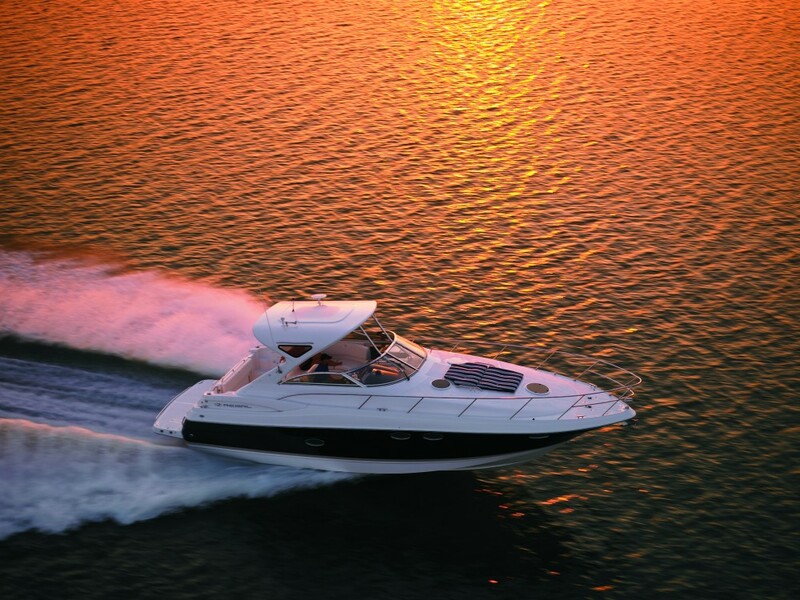 One of the main benefits of a stepped hull is that you can go faster with less power. When you can top out at close to 50 mph, as we did with the 2400, who needs more horses? Regal offers eight power choices from Volvo Penta and Mercury MerCruiser — including one diesel — ranging from 260 to 375 hp. You'll gain about 10 mph more top-end speed with the largest engines, while the smaller ones offer a thriftier fuel burn rate of around 8 gph. 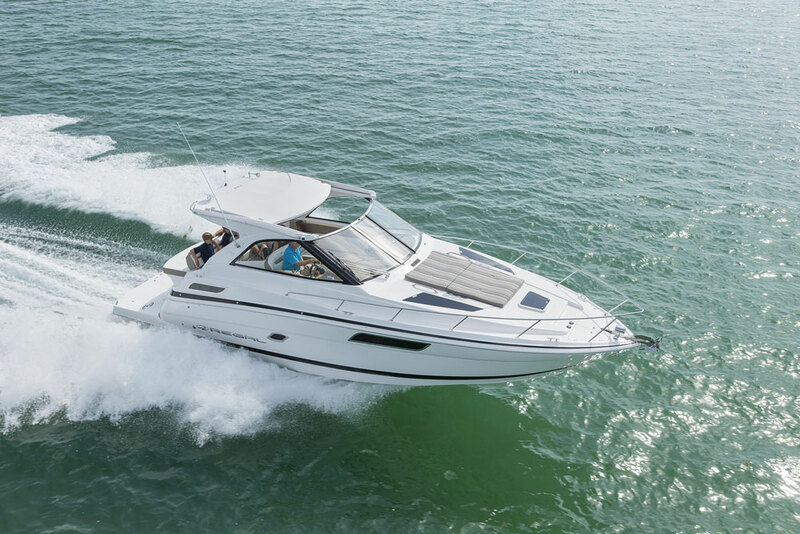 In addition to being a solid-performing boat, the Regal 2400 is a very spacious and comfortable vessel. It's rated to carry up to 10 people, and the onboard space rivals that of comparably sized deckboats. 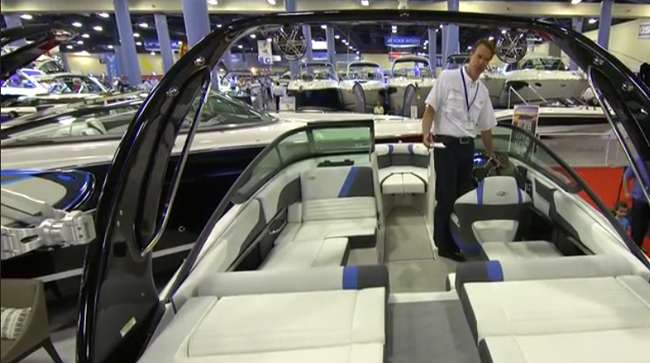 Both the bow and the stern seating areas can be converted to sunpads with optional filler cushions. An optional dining table is available, as well. When you set it up in the cockpit and turn the helm and companion seats around to face it, you'll have seating for eight. The helm and companion seats both have a flip-up bolster, for convenient stand-up operation. The Regal 2400's helm is attractively designed, with burlwood accents, but the real focal point is its array of fog-free Faria gauges. They include an integrated speedometer with fuel and voltage gauges, as well as an integrated tachometer with oil pressure and temperature gauges, plus separate depth and trim gauges. There's also a Dino steering wheel with five-position tilt. Regal has made every effort to use all available space for storage. Most of the bench seating lifts for access to dry compartments, and there are two stowage spaces in the helm console. One is accessible from the starboard seatback in the bow, and the other can be reached from the walkway between the bow and cockpit. Knowing that water skis and wakeboards take up a lot of space, Regal's designers provided not one but two places to stow them on the 2400. There's one compartment in the cockpit sole and another on the swim platform. A cockpit hatch opens to reveal a space that extends up into the bow. The stern storage space is actually one nearly full-beam compartment that's covered by three hatches. This makes it easy to get to small items without having to lift a single heavy hatch. With all the space on board the 2400, it's easy to move around without bumping into things or people. Deck surfaces are skid resistant — and getting on or off the boat is safe and simple, thanks to two three-step boarding ladders (one at the bow and another at the stern). Each ladder hides away when not in use. A refreshment center, which features a sink with pressurized water, is molded into the portside gunwale. A section of bench seating on the starboard side lifts with the help of a gas cylinder, exposing a removable 25-quart cooler. For entertainment, Regal includes a Kenwood AM/FM stereo with a single-disc CD player and four speakers as standard equipment. This system can be upgraded to a premium package that includes a six-disc CD changer and audiophile-worthy speakers. 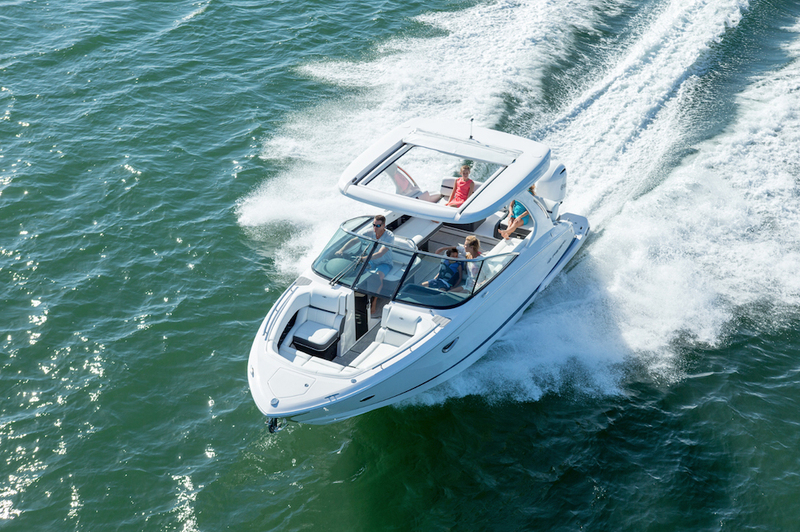 The most important comfort feature on the Regal 2400 has to be the head compartment. It's neatly hidden behind the helm console, yet it's surprisingly spacious inside. There's a chemical toilet and a sink with pressurized water, plus an opening portlight. Regal has always been known for including an impressive array of the little things that add convenience and safety on the boats it builds. The 2400 has brake lights, turn signals and hazard lights built into the transom as a backup for your trailer's lights. Moreover, you'll find a convenient trash receptacle inside the helm console, and a bow scuff plate protects the hull when you beach your boat. The boat's through-hull fittings are chrome (not plastic), and the hull's colors and graphics are molded into the gelcoat. When it comes time to clean up, it's easy: You simply unsnap the cushions and carpeting, then hose down the entire cockpit. If you regularly do your own engine maintenance, you'll like the 2400's engine compartment. It's completely gelcoated, with no rough edges to scrape your fingers. There's ample space to gain access to the engine from all sides, and doing routine fluid level checks is easy. Look closely at the 2400, and you can see that Regal builds a fine product. It's evident in the extra steps the company takes, from the use of French-stitched upholstery to the molded-in graphics. You might pay a few dollars more for this level of quality, but in the long run, the results will be lower maintenance costs and higher resale value. Dino tilt steering wheel; power steering; helm and companion seats with flip-up bolsters; compass; in-dash depth sounder; Faria gauges; dual battery switch; Kenwood AM/FM stereo with CD player and four speakers; head compartment with chemical toilet and sink; cockpit sink; LED cockpit courtesy lighting; snap-in carpet; 25-quart removable cooler; Bimini top; cockpit cover; extended swim platform; bow scuff plate. Aft filler cushion; automatic fire extinguisher; bow filler cushion; side and aft canvas with forward connector; cockpit table; fume detector; gray water system; Kenwood premium stereo system upgrade with CD changer; transom remote for stereo; rail-mounted grill; pumpout fittings for head; transom-mount tilt switch; Raymarine 45 VHF radio. Regal 29 OBX: An Outboard Powered Regal Bowrider?